« All these years, you’ve been tying your shoes wrong! 1. 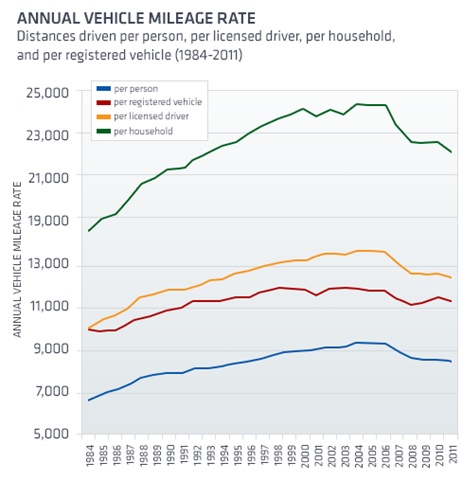 Long-run auto sales … fewer miles mean cars last longer; fewer car owners mean, well, fewer cars bought. 2. Gas taxes … how to fund infrastructure upgrades if less gas is being bought? 3. Male identities … male egos are tied to sports & cars … what happens when you take one of those away? This entry was posted on July 29, 2013 at 6:57 am and is filed under Autos - Travel, Demograhics. You can follow any responses to this entry through the RSS 2.0 feed. You can leave a response, or trackback from your own site. Does this say that Americans are really driving less as a nation, or that there are just more drivers? Less per person but I wonder if that does not still mean that there are more cars on the road. It sure seems there are.